Something wasn’t the same. The bike rides weren’t any harder, but I was slowing down. Unlike years past, I wasn’t seeing progress in my riding as I trained. What used to be fun was a struggle that left me breathless. No matter how good of shape I was in, I struggled to catch my breath. And it wasn’t the same as being winded. It was a totally different sensation, like I could only breathe out of the top of my lungs. It finally got the best of me during Cycle North Carolina’s Coastal Ride. We were riding near Washington, NC, through small coastal towns and farm communities and along the Pamlico River. There was a strong headwind, blowing really hard. I had to stop, take a break, stop some more, and finally shorten the distance of my ride. It was time to face the fact that I had a problem. Back home, I went to see my primary care doctor. He said it sounded like asthma, and did an X-ray to make sure that something else (like a foreign body in the airway) wasn’t causing the symptoms. He referred me to a pulmonary specialist for lung function testing, and assured me that if asthma was the diagnosis, I could manage it with some planning. And asthma it was. I always had weak lungs. I had pneumonia and bronchitis several times as a child and an adult. Mold and mildew always made me cough, but sports and exercise never bothered me until now. I thought being raised in a home with second-hand smoke was the main culprit. But a combination of genetics, environmental irritants and more puts people at risk. Nearly 26 million Americans have asthma. Women are more likely to have adult-onset asthma – even though as children, boys are more likely to have asthma than girls. I’m not proud of this, but at first, I was mad. Really mad. It was crushing to know that no matter how hard I worked, I just could not ride with the same intensity. In addition to the usual changes and challenges of aging, my asthma would also hold me back. I worried about how to continue the activities and adventures of my lifestyle. 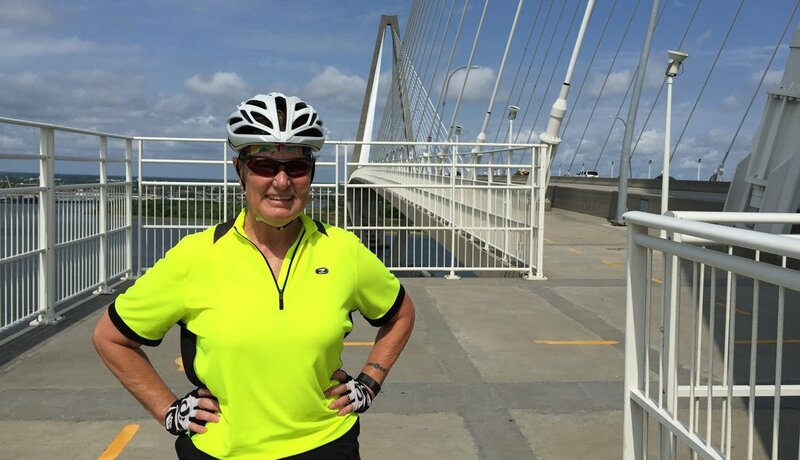 Libby Rose continues bike riding, in places like Charleston, SC, in spite of her asthma. During a couple rides, it was so hard to breathe that I was afraid I’d end up in the emergency room. I had to stop and wait on the side of the road for Martin to come back and pick me up. As silly as it may sound, developing the habit of always having my inhaler has been tough. Several years in, I still (somewhat jokingly) think about tattooing “Do you have your inhaler?” on my wrist. But my lung doctor encouraged me to stay active for the sake of my health. He said I might not have a “fast” or an “up” gear anymore, but we would develop an action plan that fit my health needs and my lifestyle. What triggers breathing issues and asthma attacks varies from person to person. I had to be aware of my particular triggers, which were exercise and environmental and seasonal allergens. I learned how to properly use an inhaler and to always carry one with me. A peak flow meter helped gauge when I was struggling with its green, yellow and red numbers. I knew I had to keep exercising to stay healthy and happy. When I’m active, I feel better physically and mentally. And when I don’t get out and move, I can tell that those good chemicals aren’t in my brain and I’m not as sharp. Things like biking, swimming and hiking are vital to my mind, body and spirit. The pity party was over. I started looking at it from a different perspective. In the great scheme of health problems that crop up with age, something that can be controlled wasn’t bad. Some people my age may have thrown in the towel. But I wanted to keep going, so I had to work at it and make some changes. 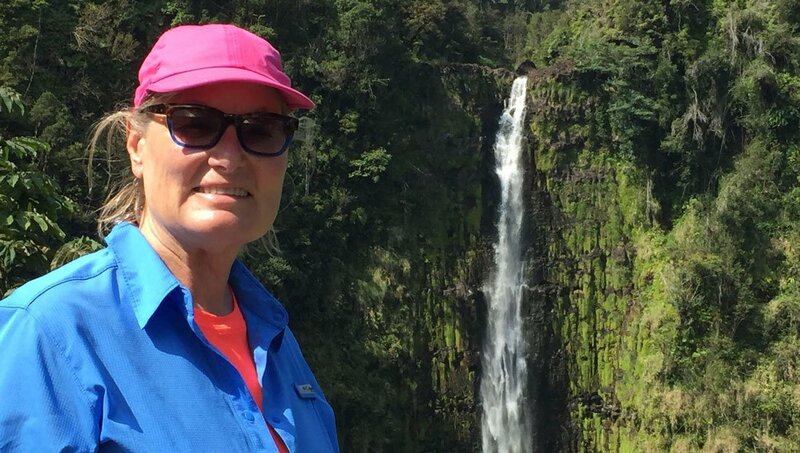 It took trying several different medications and inhalers, learning about their side effects, and tweaking my action plan to get my asthma under control during exercise. To keep doing the things I loved, I also had to compensate for my limitations. Before starting activities, I warm up my lungs with quick walk and prime them with medication. Exercising in cold weather is difficult, so I use a muff over my mouth to warm the incoming air. When I swim laps, I swallow my pride and use a snorkel to avoid breaking my rhythm gasping for air. I walk instead of run. I still have a hard time with hiking, but it’s worth it to spend time outdoors and get away from it all on the trail. Going uphill will always be hard. I just have to go slow and steady. Hiking uphill with asthma is always hard, but worth it. Walking is fine, and swimming with a snorkel is ok, but I truly struggled with my biking. We tried to stick to flatter rides, but hills were still a serious problem. I couldn’t keep up with Martin or our friends, so I got an electric assist bike. I first tried an electric bicycle, or ebike, in Sonoma, California. I didn’t have a problem with any hills, and we had a glorious day of riding. 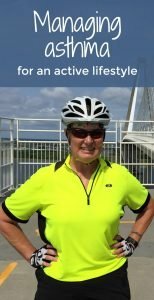 For my 60th birthday, I bought an Easy Motion electric bike. It was so joyous to enjoy biking again, but I hated that other riders could see that my bike was different. At first, I dreaded their questions and comments. But now I’m a proud ebike ambassador. 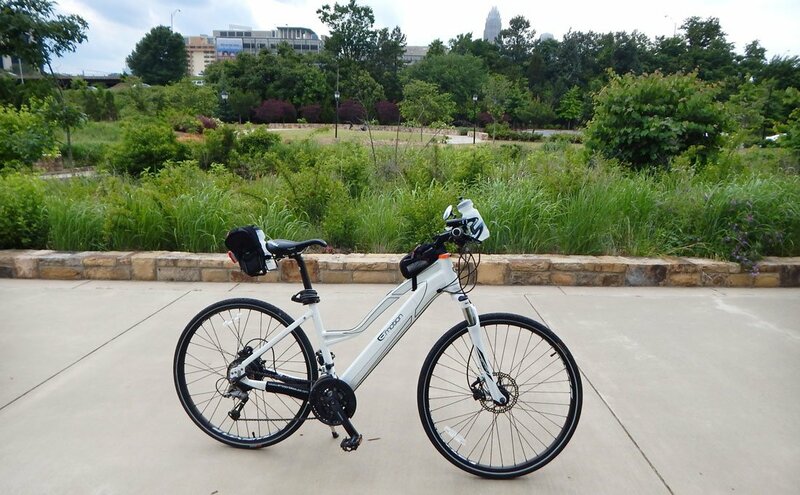 An electric bicycle, or ebike, allows me to ride up hills without fear of an asthma attack. Asthma has slowed me down a bit. It can be scary. I’m still learning about and adapting to having asthma. But I’m still moving forward and enjoying a very active life.